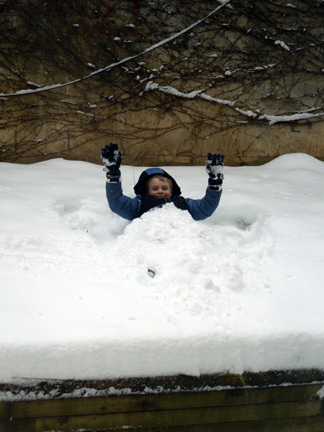 For a kid, a blizzard is just another day at the beach… buried in snow, not sand. You want evidence that climate change is real? Just look at the northeastern U.S. today, and you’ll see how far removed we are from what used to be “normal” weather. A blizzard is coming. In fact, in my hood, it’s been and gone (we got less than a foot, so it’s a bit of a fizzle but enough for me to kick my kid out of the house to play in). Maine is certainly being battered (I’m reading of 5′ drifts), and the pictures are gorgeous! What strikes me about this storm is how much people are freaking out about it. This goes beyond media hype and herd mentality in America. Yes, we’ve become a bunch of panic mongers, but in trying to get to the root of the mania, I’ve come to the conclusion that the simple truth is far too few people in the Lower 48 remember what winter is supposed to look like. Winter is not, for example, supposed to be like the 2011-2012 season: snowless, warm and (mostly) dry. When I was growing up, I remember multiple blizzards (most famously, the 1978 storm that netted us a week and a half off from school!) and brutally cold winters. I had a horse, and I can clearly recall -20°F temps with windchills down to -80°F. We had to go out every few hours around the clock to break up the water troughs. The horses would simply stand there with their butts to the wind (granted, we were double graining and double haying them that winter… and they all lost weight). Those were harsh but not uncommon winters. Fast forward 35 years, and you find an entire generation that has never seen that kind of weather up close and personal. I was happy with the snowfall yesterday, if for no other reason it gave me the opportunity to teach my son how to dress appropriately for such a meteorological event (dress in layers with a wicking fabric next to your body; make sure there’s no exposed skin; if anything gets wet from snow, come inside to change; cold is okay, but wetness can create frostbite; and for heaven’s sake: wear a hat!). Whenever I hear people whine about cold weather in January-February or hot weather in July-August, I really want to clock them one. I don’t like moderate temps in summer, and I abhor rain in winter. If I wanted to live sans seasons, I’d move to San Diego (which recently was having 40° weather while Brooklyn was pushing 70°). I do my best to dress appropriately for seasonal weather. In fact, what I disdain is having to change my wardrobe daily—or even hourly—to keep up with the rapid and unpredictable changes in the weather (our lovely snow will be gone in 48 hours; it’s supposed to rain all day Monday). And while I mourn any loss of life in a storm, I have to wonder why on earth anyone would go out driving and get stuck on the highway in a blizzard that was predicted so ubiquitously that you couldn’t avoid the news of it even had you wanted to! A blizzard in February? That’s what we call winter, folks. It’s the reality in which I grew up! Maybe climate change denial stems at least in small part from the fact that the new normal isn’t snowfall in the northeast in winter, but two full-strength hurricanes in as many years in autumn. I guess the common blizzard is drifting—pun intended—into the realm of being a 100-year event. Tags: Blizzard, Climate Change, Nemo, postaday, Snow, Winter. Bookmark the permalink. ’78 was a very good year to be a kid!